Q: Is it safe to Travel in Egypt? A: Many U.S. travelers think negatively when it comes to safety issues about traveling to Egypt due to concerns for traveling in other Middle Eastern Countries. Air travel has probably never been safer than it is now. Once you are in Egypt, the Egyptian people are warm, hospitable, and for the most part, genuinely delighted to interact with us. Beyond that, tourism is the mainstay of the Egyptian economy, and the security precautions the Egyptian government has put in place to protect tourists for the last five years are impressive. There have been no problems in many years in any of the regions where we travel. If seeing Egypt has always been your dream, this is a good time to turn the dream into reality. However, whenever a country has internal problems and unrest like Egypt, it is always wise to be cautious, follow instructions, not wander off or do things that are contrary to instructions, and always be attentive to the leaders to insure the tour unfolds in the highest best way for everyone concerned. Its also important to drink a lot of water, stay grounded, clear and directed throughout the tour. Q: Can cameras and video equipment be used at all sites? Travel with an open mind. The cultural differences that you will experience are part of the adventure. You will find the Egyptian people welcoming and eager to help make your journey everything you hoped for. Embrace the exuberant quality of Egyptian life, smile and relax, and soon you will feel comfortable and at home as you move through our magical mystery tour. DOCUMENTS: All participants are required to have a passport that is valid for 6 months beyond the return date, to be carried on your person or stored safely at all times. It is a good idea to photocopy the picture page to carry in a separate place in case of loss and to also keep a copy at home. A visa is required for entry into Egypt. If you are a US, Canadian or British citizen or a member of the EU, it is $25USD. Or, you can get one from your nearest Egyptian embassy, however it is much more of a hassle, costs more, and requires relinquishing your passport for some time. 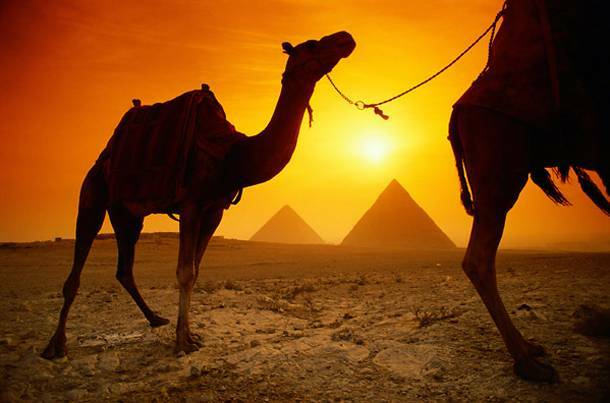 Other countries qualify for visas at the Cairo airport, so check with your embassy to be sure. **TRIP INSURANCE: A journey of this nature is a financial investment. Therefore, we strongly recommend that all participants obtain short-term travelers insurance covering lost baggage, accident/life and trip cancellation. Trip cancellation insurance covers your losses on non refundable air and land costs for trips canceled due to personal or family illnesses and unforeseen documented emergencies. It also covers the cost of emergency evacuation from remote areas. For your convenience, the more expensive "Cancel for Any Reason" policies will also cover cancellation in certain cases of political unrest or civil emergencies. PREPARATIONS/ PRECAUTIONS: There are no inoculation requirements for persons with flights originating in the US or Europe. However, it is advisable to consult your physician regarding your personal needs. The alternative suggestions we offer are found effective by prior travelers and local herbalists. Doctors and medical facilities are available in most places, however it is recommended that each participant bring their own personal supplies plus any medication needed. Your good health and good physical condition will enhance the experience for you as well as the group. The most common health issue is diarrhea. It is recommended to take megadophilus or acidophilus daily for at least one month prior to travel as well as for the duration of the trip. You may also want to bring an herbal immune-support formula. Do not drink the tap water in Egypt! Drink only bottled water, and use bottled water to brush your teeth. Bottled water is readily available everywhere. Remember to keep medications handy in carry-on, not packed away in luggage, if they meet TSA standards. Check online for current TSA restrictions. We strongly stress the use of only bottled water for drinking and brushing your teeth. This can be purchased readily along the way, and at hotels. CLIMATE/CLOTHING: The climate in Egypt is dry year around. December is a perfect time to visit Egypt with the daytime temperature average in the 70 – 85+F ranges, while evenings can be quite cool, especially on the river, so you will need a wrap/coat at night. Occasionally it is cool in Cairo as well, yet it can be quite warm in the south. Whatever the activity, women should remember that Egypt remains a conservative country and it is important to be respectful. Shoulders should always be covered outside the hotels and boat (there are beautiful shawls available in Egypt). Keeping this in mind, comfortable, loose-fitting clothing for layers in the daytime. A light jacket or sweater for early morning and evening and also for the air conditioning in the hotels are advised. Wear comfortable walking shoes—sneakers or sandals with a supporting back strap, and cotton socks. We will be doing a lot of walking. Pants are certainly acceptable for the women and are definitely recommended for camel or horseback riding. In the evenings, as everyone will be dining in very pleasant surroundings at our hotels or local restaurants, somewhat nicer attire would be appropriate. Casual is acceptable, though you might plan for one or two evenings. We certainly have opportunities here to be festive, and we will have a chance to shop where wonderful, fun clothing can be purchased. Hairdryers are provided in some of the rooms. BAGGAGE: Each passenger is allowed to check-in two pieces of luggage. The total dimension (length + width + height) of both pieces must not exceed 273 cm (107 in) and the outside linear dimensions of each bag must not exceed 158 cm (62 in.) The weight of each piece is limited to 50 lbs each (70 lbs for Business Class). Carry-ons are limited to two pieces, at no more than 15 lbs each. We highly suggest that you only bring one suitcase with you to Egypt and bring or buy an empty duffel bag for shopping goodies for your return. If you bring two pieces of luggage with you to Egypt you will have no room on the return, so pack light and shop there! Remember to bring an extra set of clothes and your valuables in your carry-on just in case! A daypack is often useful. Although you will never be required to carry your luggage, you will appreciate traveling light. COMMUNICATIONS: International telephone calls from Egypt are easy to make, and can be dialed directly from our hotel rooms. They are much more expensive from Egypt than from the States, depending upon your international plan. You can also call the US, let the phone ring twice, then have your party call you back at a fraction of the cost (or pre-arrange your own "code"). We recommend that you get an international calling card from a reputable phone company that has an access number in Cairo, such as ATT or MCI. FILM: If you are not using a digital camera, be sure to bring all the film and extra batteries that you will need as these are very expensive there. Likewise, film should be brought back to the states for developing. The film expiration date should be carefully checked and be good for at least one year from the date of purchase as it seems to deteriorate rapidly in Egypt's arid climate. Bring along a flash attachment with replaceable batteries if possible. This, along with your wide-angle lens, will produce the best results when photographing inside temples, pyramids and tombs. Since electric current in Egypt is 220 volts, special adapters and plugs will be needed for rechargeable units. And of course if you are using digital technology, you can bring extra memory cards. There is very limited access to download your images while you are there unless you bring your own computer. MONEY AND CURRENCY EXCHANGE: The currency in Egypt is the pound, which is equal to 100 piasters. As of April, 2011, 1 Egyptian pound (E£ or EGP) = $0.168 USD; $1.00 USD = E£5.95. You will have no difficulty exchanging U.S. dollars into Egyptian pounds. Many banks in Egyptian hotels are open around the clock. We recommend waiting until you are in Egypt to exchange money. Traveler's checks are more of a hassle because you are required to show your passport in order to cash them, and many shops will not accept them. Hotels and some larger shops will take VISA (not as many take MasterCard). ATM's are not always convenient, although they can be found. It is recommended that you carry your traveler's checks and cash in large denominations, although some smaller denominations can be convenient, as well. A money belt or other safe, secure means of carrying money and documents is advisable. Once currency is exchanged, it helps to carry many one and five pound notes for gifting and tipping. THINGS TO BRING: PLEASE DO NOT OVERPACK! There is nothing less fun than carting around extra baggage. Keep in mind there is a wide range of things to buy at the markets. Adaptor plugs are the standard European type with two round pins. An adaptor is adequate for most appliances. A converter is optional but required for certain appliances.